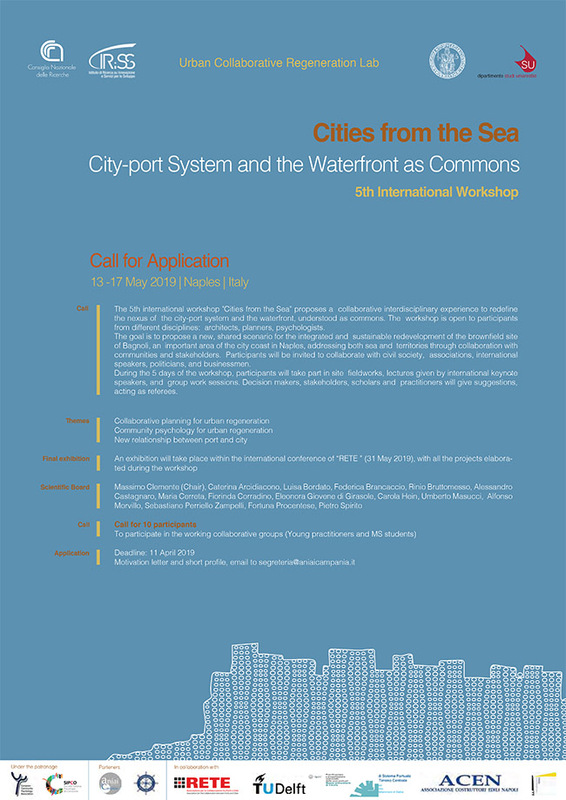 The 5th international workshop “Cities from the Sea” proposes a collaborative interdisciplinary experience to redefine the nexus of the city-port system and the waterfront, understood as commons. The workshop is open to participants from different disciplines: architects, planners, psychologists. The goal is to propose a new, shared scenario for the integrated and sustainable redevelopment of the brownfield site of Bagnoli, an important area of the city coast in Naples, addressing both sea and territories through collaboration with communities and stakeholders. Participants will be invited to collaborate with civil society, associations, international speakers, politicians, and businessmen. During the 5 days of the workshop, participants will take part in site fieldworks, lectures given by international keynote speakers, and group work sessions. Decision makers, stakeholders, scholars and practitioners will give suggestions, acting as referees.